'He looks heroic and he can walk fast but he's kinda got a negative attitude,' observes billionaire investor Morris (Rainn Wilson) during his first encounter with Jason Statham's Jonas. When Morris's pet research project frees a 75-foot megalodon from beneath the ocean floor there's only one man staunch enough to swim after it. Statham's presence here is nothing short of essential as he turns being cheesed-off into an art-form. Massive shark movies have tended to be all about the shark, however this everyman of action deserves at least equal billing; the actor applies himself to the task with characteristic resignation and notable prowess. The prologue sees diver Jonas make a tough call after an unseen sea beast attacks his colleagues. Disbelieved and disgraced, five years later he's found drunkenly moping in Thailand but is brought to an underwater research facility off the coast of China to rescue his ex Lori (Jessica McNamee) from a suspiciously similar threat, giving him the opportunity to deliver 'the world's best I told you so'. Jonas is poised for action when the beast is unleashed, while romance with marine biologist Suyin (Li Bingbing) offers this loner the chance of a ready-made family – she's got her cute daughter in tow. 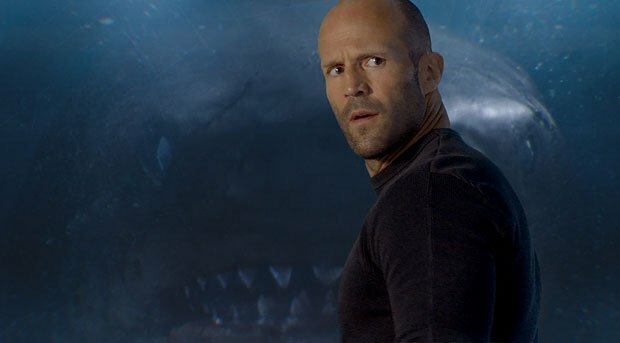 Basically a $150million B-movie, The Meg channels the straight-to-DVD spirit of such esteemed predecessors as Mega Shark vs Giant Octopus and the Sharknado films, whilst borrowing liberally from the Jaws series and Deep Blue Sea. The creature itself is no masterpiece of CGI but proves a ferocious-enough adversary, even if it might have been more fun to eschew the relative family friendliness. If Jon Turteltaub's film doesn't reach the comedic heights of, say, Lake Placid, there's enough humour to see it through, some of which is undoubtedly unintentional. The occasional whiff of a more po-faced disaster movie approach risks dragging things down; any attempts to take itself seriously are a bit of a disappointment. Still, the bland earnestness of the supporting cast acts as an amusing backdrop to Statham's showboating. Emboldened by his hilarious turn in Spy and his scene-stealing in the Fast & Furious films, this is as confident as we've seen him. Sulking, frowning and quipping with aplomb, Statham brings to the table all the grandeur of a bloke fist-fighting in a car park – paired with the outlandish premise, the contrast works magnificently. As he butts heads with the prehistoric fish in a plot of escalating idiocy, it's a role he was simply born to play. General release from Fri 10 Aug.